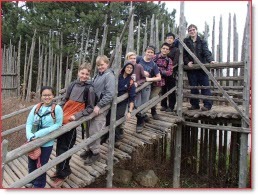 The Venturer Scouts program offers exciting, real life, hands-on experiences for youth. In 2015, we participated in the 23rd Wold Scout Jamboree in Japan. We sent a representative to an international development project to build a school in Madagascar in 2014. We helped run the activities as Offer of Service (OOS) at the Canadian Scout Jamboree in 2013 in Alberta. We represented Canada as part of the Canadian Contingent to the 22nd World Scout Jamboree in Sweden in 2011. Our structured Activity Leader and Scouter-in-Training programs will help you earn the mandatory high school volunteer hours, Duke of Edinburgh Award and Queen’s Venturer Award. 7th Markham Venturer Scouts meet on Monday nights from 7:00 p.m. to 8:30 p.m. at Wismer Public School located at 171 Mingay Ave., Markham, ON L3P 4B5 (south of Bur Oak Ave., west of Highway 48). Our Venturer Scouts section received the Program Quality Award in 2013-2014, 2014-2015- and 2015-2016 in recognition for meeting all of the objectives which are laid out in the Program Standards.